Retro gaming doesn’t get any better than booting up an Amiga emulator, loading up a disk image and watching as the Kickstart screen disappears, to be replaced by an amazing 16-bit game. Or does it? Well, that really depends on whether you’re using a software emulator, or a physical device. The ARMIGA Full Edition is an ARM-powered Amiga “clone”: read on to find out what we thought of it. There was a time when the PC was not the all-powerful, all-conquering behemoth. A time when the IBM-compatible computers (as they were then known) with their replaceable components struggled for attention and processing power in the face of superior computers. Back when Apple was beginning its slide towards bankruptcy and Microsoft made command line operating systems, a team of coders were plucked from Atari by Commodore, and given funding to complete development of one of the most revolutionary computers of all time: the Amiga. A computer that lives on in emulators and YouTube videos, the Amiga had several iterations (most popular were the Amiga 500 and 1200 models) and even found itself packaged in two living room friendly CD-ROM devices (the CDTV and CD32). But by the mid-1990s, the Amiga was running out of steam in the face of more powerful PCs and games consoles. Several relaunches have been attempted, none of which managed to gain traction. So, what is this device we’re looking at, offering as a giveaway to one lucky winner? Well, it’s an ARMIGA, a dual-core ARM processor-powered Amiga clone (more on that below). Two versions are available: the larger, Armiga Full Edition, complete with built-in 3.5-inch disk drive (which we’re giving away); and a standard, small Armiga Small Sized Edition with a microSD card slot. Costing around €190 from armigaproject.com, and offering HDMI output (720p) for HDTVs, games can be played in 16:9 or 4:3. 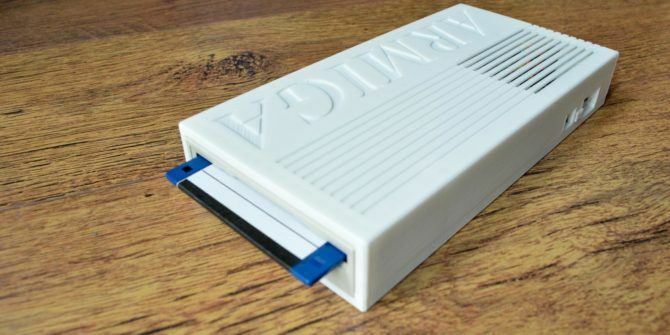 A custom floppy controller has also been developed, for reading original Amiga disks, which is arguably the most impressive feature. This means Double Density disks can be imaged, and the data copied to your PC. The ARMIGA’s developers have also included support for loading up disk images of games and apps via microSD or USB. As with any emulation, you need to have the original title to use an internet-procured disk image legally. However, with a 3.5-inch disk drive built in, if you have your original disks, or have bought some from eBay, this won’t be a problem! The ARMIGA offers enough USB slots for a keyboard and mouse, or gamepad. A powered USB hub can also be connected. Capable of emulating the Amiga 500 with 1 MB of RAM (the second iteration of that model) and the Amiga 1200 with 2 MB (which also featured a different graphics chip), the ARMIGA Full Edition is the closest thing you’ll get to an original Amiga. It’s almost 30 years since I first unboxed an Amiga 500 computer. With only dreams of possibilities that time, the anticipation remains memorable. This time, I’m almost excited, even though I sort of already know what to expect. In the box, we have the ARMIGA device, made in Spain and mounted in a 3D-printed case, evocative of the original computer. A HDMI cable is also included, along with a USB power supply, microSD card (already inserted in the computer) and SD adaptor card. On here, you’ll find a collection of games to get you playing right away. Two games on traditional 3.5-inch floppy disks are also included. The grille, plastic color, and typeface each recall the 1980s Amiga devices. If anything, however, this is a more delicate piece of kit. It’s a little flimsy, which is probably due to the 3D printed case; the grille feels as though it could break with slight pressure. The case could probably do with some rubber feet, too, but these are easily acquired. A peek through the grille reveals the device doing most of the work – a Cubieboard – a Raspberry Pi-sized mini-computer, with some hardware customizations. Looking at the ARMIGA with the disk drive facing you, several slots are found around the sides. On the left is an Ethernet port, as well as a mini-USB port, which should not be used for powering the device. Below this, you’ll find a reset button. On the rear of the ARMIGA are two USB slots, and the microSD slot, while on the right side are the HDMI cable slot, power connector, and power button. Underneath you’ll find manufacturing details and confirmation that the device is powered by Cloanto’s Amiga Forever software, with legitimate, licensed v1.3 and v3.1 ROMs. Getting started with the ARMIGA is almost as simple as getting started with the original. Simply connect your keyboard and mouse, ensure that the microSD card is correctly inserted (otherwise it will boot to Android!) connect the power cable, and press the power button. As long as the HDMI cable is attached to your display, the Ubuntu-based operating system will boot up and drop you into the ARMIGA user interface. This can be controlled via keyboard or with a USB games controller. You’ll be faced with the Home menu, which can be returned to at any time while playing games by pressing the F11 button. Self made ADFs — browse the ADF (Amiga Disk File) images that have been created with the disk drive. Browse SD card — view the ADF files saved on the microSD card. Browse USB — find ADF files imported from a PC. Savestates — it is possible to simply stop playing a game at any point using F11, and save the game as an image to be resumed later. Settings — alter aspect ratio, Fast Load toggle, and adjust the Graphic Filter (Pixel Doubler, Scanlines, CRT effect). Finally, there is a Power menu option, where you can switch to A1200 mode (default is A500 mode) Reboot or Shutdown the ARMIGA. Want to get your favorite Amiga games running? You’ll need a USB joystick or game controller, along with the ROM of the title in question. If you own the game already, better still, as you’ll be playing it legally. There are three ways of getting game ROMs onto your ARMIGA — all dead simple. The first is via USB stick. Simply copy the ROM files from your PC to the stick, insert it into the ARMIGA, and use the Browse USB to browse the USB device. Alternatively, you can switch off your ARMIGA, and eject the microSD card. Slot this into the included SD adaptor and insert that into your PC. From there, copy the ROM files into the Games directory, safely eject the card, and return to the ARMIGA. After powering on, you’ll find the game ROMs listed. You can also copy data to a networked ARMIGA via SFTP. See below for more on that. Happily, several game ROMs are already included with the ARMIGA, so you can simply use your keyboard or game controller to launch these. Simply navigate the Browse SD card screen, select the game you want to play, then Launch. Within a few seconds, the emulation software will have loaded up the game. We tried three titles, Lotus Esprit Turbo Challenge (1990), Katakis (1988) and Worms (1995). All played well, although there was some delay in Katakis loading up. By now you will have noticed something pretty relevant. The ARMIGA isn’t strictly speaking a clone of the Amiga. Rather, it is a system that has been painstakingly put together in order to reliably run Amiga software. In the case of the ARMIGA Full Edition, it is also capable of reading 3.5-inch Double Density floppy disks. But, it won’t boot them. Rather, when a disk is inserted, the ARMIGA will automatically create an image of it. This image (around 1.3 MB!) is then stored to the device’s microSD card. Using the main Home menu, you can then use the Self made ADFs menu item to view the disk images and run them. Think of it less as a clone, and more of an “emulator in a box”. Do you own old 3.5-inch Double Density (or Single Density) floppy disks? If so, the ARMIGA Full Edition represents the most straightforward method of retrieving data. It can also image your game disks, converting them into ADF files, stored on the microSD. These can be launched as easily as the pre-installed games. As for legacy data, you’ll need to insert a disk one at a time and wait for the automatic imaging to complete. It can take about five minutes to complete, and a pop-up notification will display on screen when this is done. You’ll also hear the disk drive stop ticking. Self-made ADF files are listed in the Self made ADFs view. You might prefer to rename each disk image, as default names are initially assigned. Once done, simple select a disk image file and click Launch to play. But what if your imaged data needs opening on a modern desktop platform? With an Ethernet cable connected to an ARMIGA computer, you can access the device across your network via SFTP. For instance, in FileZilla, it’s a case of opening Site Management, clicking Add Site, and inputting the ARMIGA’s IP address. You’ll find this by logging onto your router via desktop browser, and checking for new devices. You should use Port 22; set the connection type to SFTP. The username and password are both armiga. All you need to do next is copy the ADF files from your ARMIGA to your computer. A typical disk file will only be 1.3 MB, so this doesn’t take long. To view the Amiga disk image files on a Windows PC, you’ll need software like adfview, a free tool that adds the ability to view the contents of an ADF image in Windows Explorer. The contents of the disk image should be copied and saved to a new directory for further investigation. Typically, these files won’t have file extensions, which requires some detective work. Using Microsoft Word, Notepad, and XnViewMP, I could open all of the text documents and image files retrieved from my old disks. Documents can be saved in modern formats using built-in features in Word; XnViewMP enables the export of images into modern file formats. Great! Rather than running a desktop Amiga emulator (or even an emulator on your smartphone), why would you want to opt for an ARMIGA? Well, performance is good across the board, and unencumbered by the requirements of a desktop operating system. The version of Ubuntu that is looking after things in the background has been customized to prioritize emulation. The result is a stable, enjoyable emulation experience. And just in case things don’t run quite as planned, there’s also the option to edit your visual settings! You can swap the aspect ratio from the default 16:9 to 3:2 or traditional 4:3, and tweak the display. This is best used for graphically slow games; the Pixel Doubler, Scanlines, CRT effects can all present very different results. If neither of these work, disabling Fast Load can help. With the device’s creamy white finish and grille, plus the direct connection to your TV, it’s like having a real Amiga. Sure, there’s no automatic booting from floppy, but you can still run Workbench. With patient configuration, in fact, you can use an ARMIGA device just like a classic Amiga, running apps and games, saving data, and generally having the best retro computing experience. The ARMIGA is hiding something from you. Android! In Android mode, you can gain additional functionality with the ARMIGA plugged into your TV. 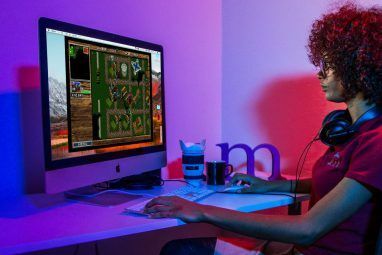 While you wouldn’t rely on the emulation of a 2 MB gaming and multimedia desktop from 25 years ago, for streaming video, you shouldn’t rule this out. With Android as the OS, installed on 4 GB flash memory, and an Ethernet cable attached, you’re ready to enjoy all the awesome streaming services that are available to any Android device. Netflix, Amazon Instant Video, and more are all available to enjoy on the ARMIGA. This is all thanks to the Cubieboard 2 board hiding inside the case. Just make sure you’re running this with a keyboard connected, as a game controller isn’t quite up to it. Oh, and just to make the device even more perfect, you can use an ARMIGA in Android mode for gaming. Despite the lightweight build quality of the case, the ARMIGA Full Edition is a superb piece of equipment. A dedicated emulator (with the option of switching to Android and enjoying media streaming), it is simple to get started and joyous to play with. Games you haven’t played for years are instantly revived; data you thought long lost is suddenly available to you again. Explore more about: Emulation, MakeUseOf Giveaway, Retro Gaming. I ordered my armiga few days ago, I'm excited to get my hands on this neat looking device. I've played Amiga ames viaemulation for a long long time and this just seems like the most easy way to enjoy so many Amiga games that I loved back in the day. Count me among those who want to join the givaway!!! This looks like the old times! Me want dat! This is a cool piece of hardware. I have some fond memories of our Amiga 500. It was like technology from Aliens. The Amiga in it's glory days was as good as most of the arcade machine games, many happy hours were passed during gaming, sometimes all through the night. with still having an A500 and A1200 and in full working order, I still have mega multi much disks and some cd's/dvd's. There is never enough Amiga in the house!!! I have a ton of floppy disks that rediscovering!! So they want us to pay €190 for a raspberry pi with a floppy drive and a home 3D-printed case? Well, it's a Cubieboard plus floppy drive with a custom-built controller to read Amiga disks. The biggest unanswered question is where is my Armiga... ? Agreed! The ability to read Amiga disks is huge. I've been waiting years for something like this.